Andalusia’s comfortable Mediterranean climate, with hot summers, mild winters and over 300 days of sunshine every year, is one of the main reasons it’s so popular with tourists. However, Andalusia has a lot of variety when it comes to its weather, so you might need to plan your holiday accordingly. Andalusia contains both the wettest region in Spain, the Sierra de Grazalema Natural Park within the province of Cádiz, and the driest place in continental Europe, the Tabernas Desert near Almería. The Guadalquivir valley surrounding Seville and Cordoba has seen the highest temperatures ever measured in Europe, while Sierra Nevada National Park, near Granada, has the lowest annual temperature on the Iberian peninsula. Huelva and Cádiz have average high winter temperatures of around 16°C. Precipitation is highest in December, and the average amount of rainy days during this month is 12 and 7 for Huelva and Cádiz respectively. Average high temperatures during July and August are 33°C in Huelva and 29°C in Cádiz.The two cities in the Guadalquivir valley, Seville and Cordoba, have average winter temperatures around 16°C and chances of heavy rainfall during December and January. The summers are very hot, with temperatures rarely dropping below 30°C even at night. July and August have average high temperatures of around 37°C, and there is almost no chance for rainfalls during this time. The best time to visit these cities is in late spring or early autumn, when temperatures are at a much more comfortable average mid 20s. Malaga has a very comfortable climate, especially from late spring to early autumn. Winters have a comfortable average high temperature of 17-18°C, with minimum temperatures around 7°C. There can be a lot of heavy rain during this period. Precipitation is at its highest in December at 100mm, but rainfalls occur as late as May and as early as October. The sea is generally too cold to swim in during this time. Summers in Malaga are warm and comfortable, with average high temperatures around 31°C. This is a very dry period with almost no chance of rainfall in July and August. 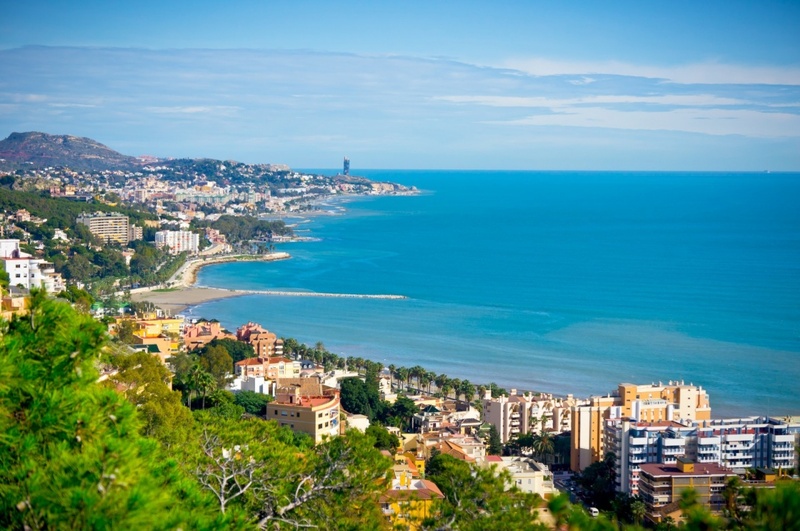 The best time to visit Malaga and Costa del Sol is in spring or autumn, when temperatures are comfortable and the sea is warm enough for a swim. This also lets you avoid the tourist crowds that flock to the beach during the summer months. Granada’s winter temperatures are quite low and can drop to 0°C during its coldest month, January. In summer, the average high temperature is 35°C. Almeria’s winter temperatures are at an average high of 17-18°C, and its summer average high is 31°C. Precipitation here is generally very low, but reaches its maximum in December with an average of 34mm.